Running shoes have come a long way. Shoes began with leather uppers and rubber soles, and have morphed into the knit materials and EVA foams that we know today. For years when people purchased shoes, they were told that they needed to break them in. The breaking in process involved slowly morphing the difficult materials to fit your foot comfortably. This process is still important with many casual shoes or dress shoes, but it’s a step you can skip with your runners. The running shoe industry is an extremely competitive space, and in the case of running shoes, competition has brought better product. Running shoes have evolved to a point that when you put a pair on, they should enhance your run right away – not impede it. Uppers are more flexible than ever. 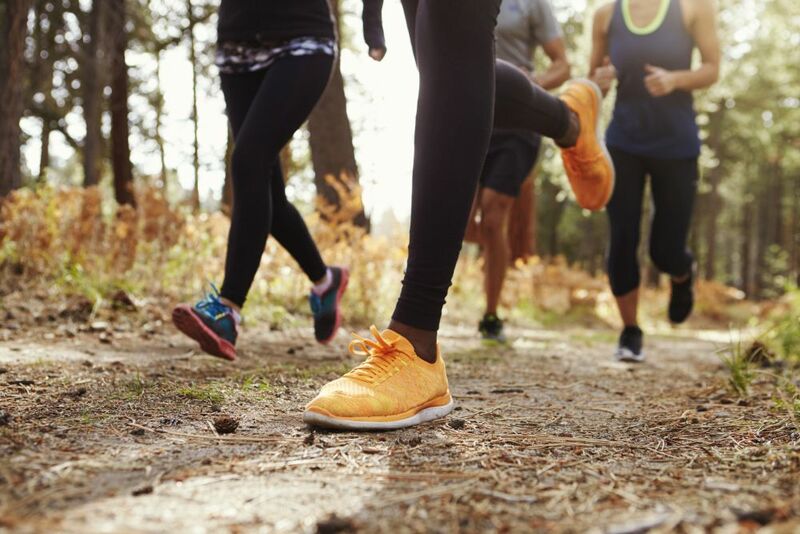 With nearly every company now including at least one shoe model with an entirely knit upper, and other shoe options which incorporate knit into their uppers, running shoes are designed to move with your foot. Mesh is another very common material. A mesh upper means that your foot can breathe and also move easily during your run. The collar of most running shoes has also been re-engineered to provide either a seamless or padded fit to reduce any chafing while keep your foot stable. Midsole’s are most commonly made from a blend of TPU or EVA foams. Adidas has had massive success with their Boost midsole, made of little pellets of thermoplastic polyurethane (a.k.a. TPU). Reebok has reentered the running world with their Floatride foam. New Balance developed Fresh Foam, which allows them to “tune” the chunk of the midsole material at different densities in order for it to perform in specific ways for different running applications, and Saucony’s Everun is another softer, long-lasting innovation. Under Armour’s HOVR which is inflused with Olefin, a wax-like synthetic material, which is incredible strong and resilient. All of these midsole’s are looking to optimize comfort and cushion so that runners can worry less about their footwear and focus on their run. Modern outsoles are primarily made of blown or carbon rubber. Blown rubber is a air-injected material that’s slightly softer and more flexible than carbon rubber, but carbon rubber is a little more durable. Most shoes are now designed with gender specific lasts. The last of a shoe refers to the foot model that a shoe is constructed on. The common gender differences of a shoe include a slightly narrower fit, a lower heel bed, and more arch support for women. These slight differences have encouraged companies to create shoes that aren’t just smaller versions of men’s shoe, but shoe made specifically for women’s feet. There are many types of shoes and not all shoes are going to work for you. If you’ve drastically changed the type of shoe you’re wearing, for example, gone from a high drop to a low drop shoe, or a stability shoe to a neutral shoe, then a slow transition is important. But this is because you’re adjusting to a dramatically different fit, not moulding the materials. If you have a history of injury or trouble buying shoes that work for you, consider transitioning from one shoe to another over the course of a few runs to see how it feels. But typically if there’s an issue with fit or comfort out of the box, that isn’t going to get better over time.